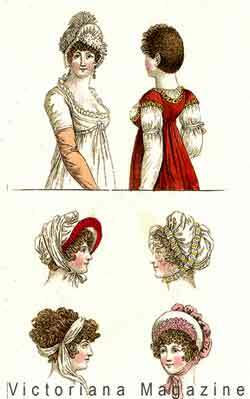 After the French Revolution, the women of Paris were the first to abandon the ornate, constricting and overbearing fashions of the 1700s. 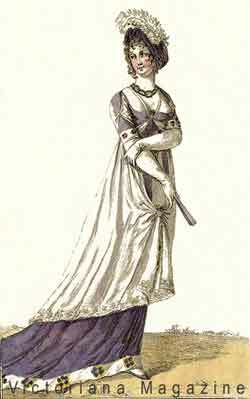 Now they wore long flowing muslin dresses based upon the classical designs of the Greeks and Romans. This new elegant style draped the figure with a flattering high Empire style waistline. 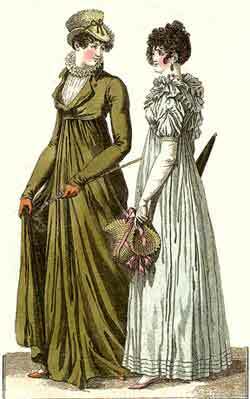 The fashions of the early 1800s were not only elegant and pleasing to the eye, but were very comfortable. 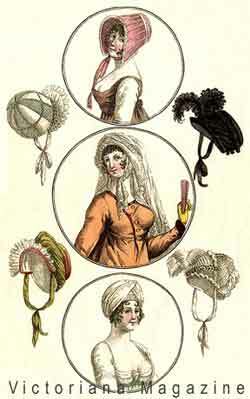 Journal des Dames et des Modes was a French fashion magazine first published in the late 18th century. 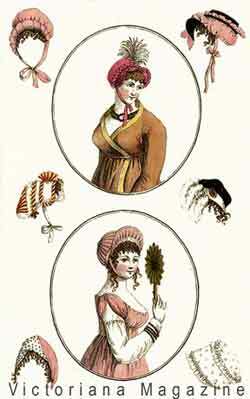 Included in their issues were hand-colored fashion engravings. 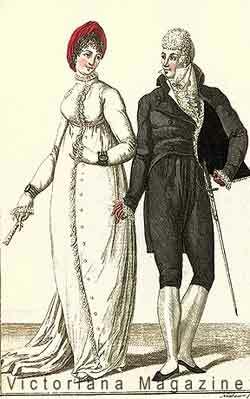 In June 1797, Selleque, in partnership with Mme. 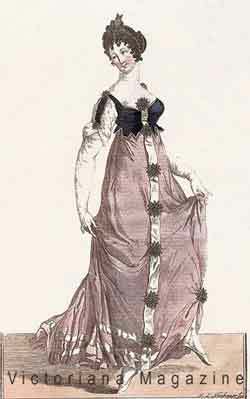 Clement, nee Hemery, founded the Journal des Dames et des Modes. They were joined, in the matter of engraving only, by an ecclesiastic named Pierre Lamesangere. On the death of Selleque, Lamesangere carried on the journal, and made it his chief business from the year 1799. The Journal des Dames et des Modes was published at intervals of five days, with a pretty colored plate of a lady in fashionable dress. On the 15th of each month there were two plates. Lamesangere himself kept the accounts, edited the magazine with as light a touch as possible, and superintended the engraving of the plates. 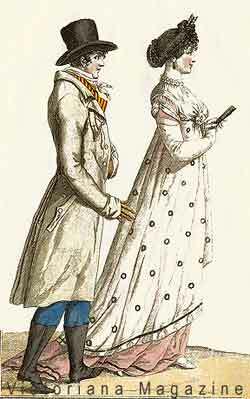 He attended the theatres and all places of public resort in order to observe the ladies' dresses. So successful was the undertaking that Lamesangere acquired a considerable fortune. His own attire was above criticism. At his death his wardrobe contained a thousand pairs of silk stockings, two thousand pairs of shoes, six dozen blue coats, one hundred round hats, forty umbrellas, and ninety snuffboxes. 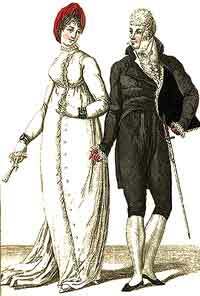 The Journal des Dames et des Modes reigned without a rival for more than twenty years, from 1797 to 1829 and forms an amusing collection of thirty-three volumes. Some of his contemporaries used to compare Lamesangere to Alexander. His empire over the world of fashion was as wide as that of Alexander. At his death his kingdom was divided, even as the possessions of the King of Macedonia were. Le Petit Courrier des Dames, Le Follet, La Psyche, and a hundred other fashion-books appeared. 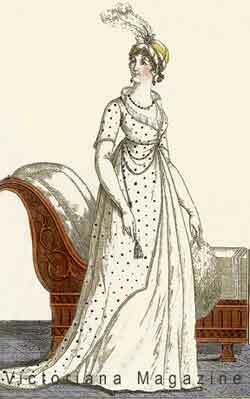 Among them was La Mode, a journal published under the patronage of the Duchess de Berri, sumptuously printed, and which became a sort of arbiter of fashion in "high life." 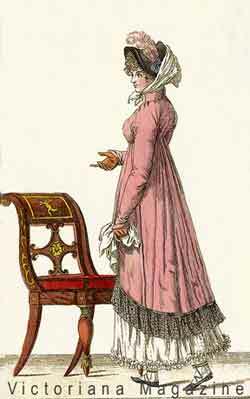 Here we include a collection of antique prints from Journal des Dames et des Modes featuring 1803 gowns, dresses, hats and bonnets. 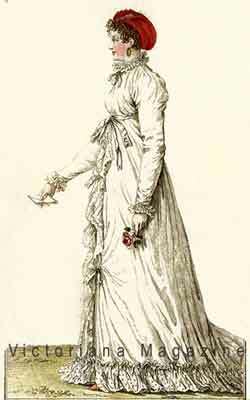 The antique fashion enthusiast will enjoy these fashion styles of the early 19th century that are portrayed in many of the recent motion picture adaptations of Jane Austen novels.